Please select an option Black -a Orange -b Red - c Mint - d Yellow - e Green -f Pink - g Lime green - h Purple - i Hot pink - j White - k Please select a selectcolor. Special deal..! BUY 2 and GET 1 FREE!! Super Strong Nylon Braided Cable for iPhone 5 and 6 and for iPads 4/5 and Air 1/2 .. 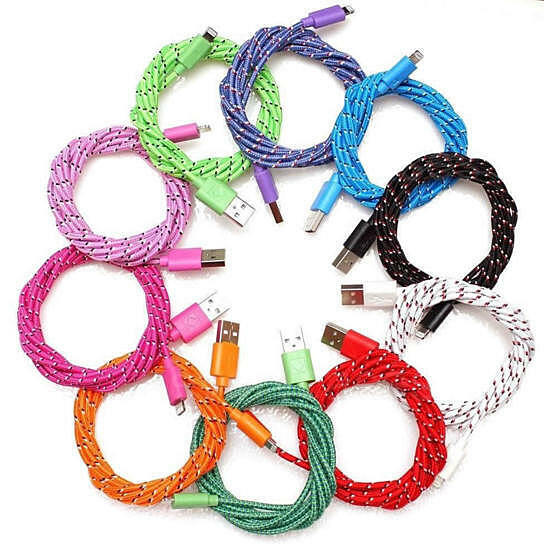 It is a 8 pin connector and the cable is 10 ft long, giving you that extra length to comfortably use your gadgets while charging..No more bending and tangling..
Comes in bright multiple colors. Compatible to Charge & Sync Cable for iPhone 6/6 Plus, 5S/5C/5, iPad Air/4, iPad Mini, iPod Touch 5 G and iPod Nano 7 G.
Super Strong PVC and cable with Nylon braided fabric cover, prevents bending and tangling. Cable Size is 3 meters (approximately 10 ft ). It comes in right colors like : BLACK, ORANGE, RED, MINT,YELLOW, GREEN, PINK , LIME GREEN,PURPLE, HOT PINK AND WHITE.